Brand new for the UK, Stoli® Chocolat Razberi™ premium vodka is the latest masterpiece from the flavoured collection of the world’s most original vodka. The delicate fusion of tangy raspberries and rich silken chocolate creates a unique and sumptuous experience. Created by Stolichnaya® Premium vodka, the pioneer in flavoured vodkas, Stoli Chocolat Razberi is the newest addition to the Stolichnaya portfolio. A delight to the senses, the delicious flavour of Stoli Chocolat Razberi is perfect for chocolate and vodka lovers alike. Velvet chocolate notes are accented by warm vanilla-cocoa, followed by a delicate hint of fresh raspberry flavour. Perfectly indulgent with a sensual, luscious texture, Stoli Chocolat Razberi has a clean finish and can be enjoyed on the rocks or as part of a delicious cocktail. Available exclusively in Harvey Nichols nationwide, priced £27.50 for 70cl. Stolichnaya Premium Vodka is an exceptionally smooth, superior vodka. Stolichnaya uses a 500-year-old premium quadruple-distillation method and intricate four stage filtration process to yield the highest quality vodkas with complex layers of aroma and flavour. Stoli Chocolat Razberi Premium vodka is one of six delicious flavoured-vodkas available in the UK: Stoli Gala Applik, Stoli Ohranj, Stoli Citros, Stoli Razberi and Stoli Vanil. 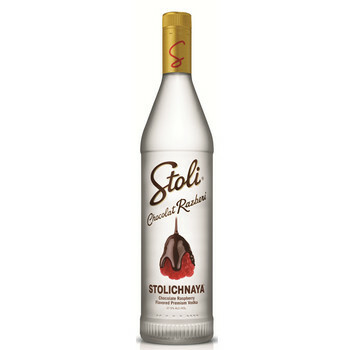 To get the latest news from Stolichnaya visit on Facebook (www.facebook.com/stoliuk) and follow on Twitter (@StoliUK).